Personal Data: Born January 27, 1976, in London, Ontario, and raised on a farm near Ailsa Craig, Ontario, until moving to Ingersoll for his high school years. Colonel Hansen is married with three children. He enjoys sailboat cruising and racing, rock climbing and mountain biking. Education: Colonel Hansen holds a bachelor of science in space science (first class honours) from Royal Military College in Kingston, Ontario (1999). He earned a master of science in physics from the same institution in 2000, with a research focus on Wide Field of View Satellite Tracking. Special Honours: Canadian Forces Decoration – 12 Years of Good Service (October 2006), Canadian Air Force Pilot Wings (May 2002), Clancy Scheldrup Memorial Trophy – Outstanding Graduate on the Basic Flying Course (2001), Air Cadet League of Canada Award – Top Air Force Graduate from the Royal Military College of Canada (May 1999), The Queen Elizabeth II Diamond Jubilee Medal (2012). Experience: Prior to joining the Canadian Space Program, Colonel Hansen served as a CF-18 fighter pilot and held the position of Combat Operations Officer at 4 Wing in Cold Lake, Alberta. His responsibilities included ensuring the effectiveness of NORAD Air Defense Operations and the operability of Deployed and Forward Operating Locations (Bases). From 2004 to 2007, Colonel Hansen served as a CF-18 fighter pilot with 409 Tactical Fighter Squadron and 441 Tactical Fighter Squadron, where his responsibilities included NORAD Operations, Deployed Exercises and Arctic Flying Operations. He completed his CF-18 Fighter Pilot Training in 410 Tactical Fighter Operational Training Squadron from 2003 to 2004. Colonel Hansen’s flight experience began at the age of 12, when he joined the Air Cadet Program. He obtained both glider and private pilot licenses through this program by the age of 17. This training led to his acceptance to Collège militaire royal in Saint-Jean-sur-Richelieu, Quebec. 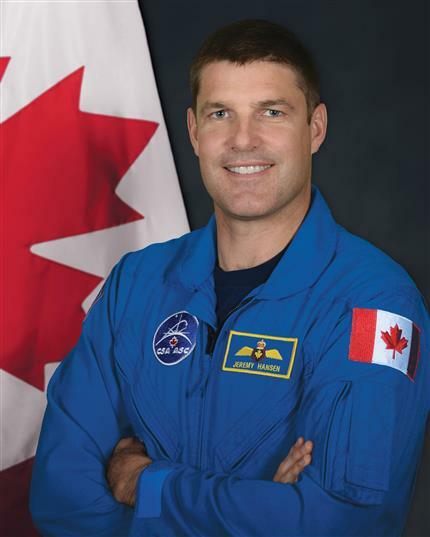 Astronaut Experience: Colonel Hansen was one of two recruits selected by the Canadian Space Agency (CSA) in May 2009 through the third Canadian Astronaut Recruitment Campaign. He is one of 14 members of the 20th National Aeronautics and Space Administration (NASA) astronaut class. In 2011, Colonel Hansen graduated from Astronaut Candidate Training, which included scientific and technical briefings, intensive instruction in International Space Station (ISS) systems, Extravehicular Activities (EVAs, or spacewalks), robotics, physiological training, T-38 flight training, Russian language courses, and sea and wilderness survival training. While waiting for a flight assignment, Colonel Hansen represents CSA at NASA, and works at the Mission Control Center as Capcom—the voice between the ground and the ISS. In addition to his day-to-day work, Colonel Hansen remains committed to building and maintaining his skills; he takes spacewalk and robotics training while continuing to learn Russian. He has taken part in geological expeditions in the High Arctic and participated in the European Space Agency’s CAVES program, during which he lived underground for six days. He was also a crew member for NEEMO 19, where he lived and worked on the ocean floor in the Aquarius habitat off Key Largo, Florida, for seven days simulating deep space exploration. Colonel Hansen also continues to fly the CF-18 fighter jet with the Royal Canadian Air Force and had the privilege of inspiring young Canadians by flying the historical Hawk One F-86 Sabre jet. This blog is a reproduction of “Biography of Jeremy R. Hansen” available at http://asc-csa.gc.ca/eng/astronauts/canadian/active/bio-jeremy-hansen.asp © Canadian Space Agency. We thank the Canadian Space Agency for supporting Space Matters by making this material available to us.